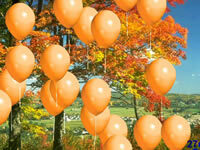 Develop hand-eye coordination skills by popping balloons as they float past. Use the mouse, touch monitor or switch to target and burst the balloons. Choose a large pointer or a cross-hair to aim. or a real challenge . . . random! For the real expert you can also change the speed of travel and the number of balloons. Setup options allow you to change the degree of accuracy needed to burst balloons. Two switch users can use one switch to pop balloons, and the second to create new ones. (Switch access is via the Space and Enter keys, or the left and right mouse buttons). Windows 95, 98, ME, XP.